It was only a month ago that I really discovered the QuickLook feature – arguably one of the most popular features in Leopard, especially if yesterday’s informal poll was any indication. It’s hard for Windows users like me that have switched to adopt all of the newer features and QuickLook was one that took me a while. I’m rather surprised that Apple didn’t include this one in OS X, especially given the way ZIP files are natively handled (auto-expanded when opening). 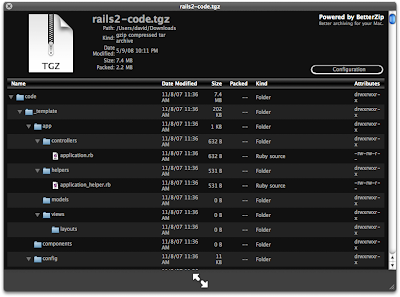 This version is free and allows you to navigate down into folders within a ZIP file without having to open it or use a utility like Zipeg to get inside. It handles all the usual file types: ZIP, TAR, GZip, BZip2, ARJ, LZH, ISO, CHM, CAB, CPIO, RAR, 7-Zip, DEB, RPM, StuffIt’s SIT, DiskDoubler, BinHex, and MacBinary. You can download BetterZip from their web site. Coming from the Windows world, where viruses and Malware are a possibility in any download I have a heightened sense of suspicion about anything I find on the Interwebs. I was drawn to this plugin on name alone. 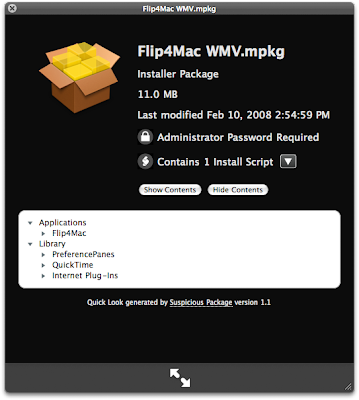 It’s a free tool that will inspect the contents of any package, displaying not only the contents but a quick view of the installation script as well. This package is made by Mother’s Ruin Software and can be downloaded directly from their web site. Though not a highly useful plugin because you can’t navigate into folders, XDD’s Folder plugin is nice when you are in that "QuickLook Zone" and want to see what’s inside a folder without popping it open. 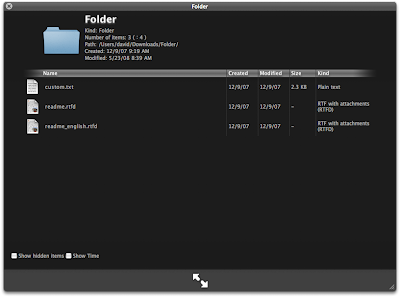 The Folder plugin is available for download from XDD’s Mac page. Version .03 appears to be the latest as of right now. This will reload all of the plugins. So there you have it – some handy little Quicklook plugins and a couple of plugin resources to help keep an eye on them. Thanks to Welles for the link that got me started down this path! What I’m missing is a QuickLook Plugin for DMG files – I’d love to see the contents without having to mount that DMG file on to the desktop. If anyone has a lead on that please shout it out!